If you have ever loved a child, then you understand what it’s like to love someone more than you love life itself. If you have ever lost a child, then you understand more about hell than anyone could possibly be expected to know. This isn’t something you get over. Only those who have lost a child can understand the depths to which this pain travels. Like most of the men who will read this book, I too am a grieving dad. The message I want bereaved fathers to understand is that I know it’s hard, I know it hurts, I know it’s scary — but you can get through this. You can survive. It will be the hardest thing you will ever experience; it will drain you physically, mentally, and emotionally. You can come out on the other side of this very long and lonely tunnel, but you will be a different person when you do. There is no going back to the old you. The best thing any father can do is to reach out for help and to know it is not a sign of “weakness” to do so. Instead, it’s a sign of courage and strength — the kind that’s required to face this battle head on. A collection of candid stories from grieving dads that were interviewed over a two-year period. The book offers insight from fellow members of, in the haunting words of one dad, “this terrible, terrible club,” which consists of men who have experienced the death of a child. This book is a collection of survival stories by men who have survived the worst possible loss and lived to tell the tale. They are real stories that pull no punches and are told with brutal honesty. Men that have shared their deepest and darkest moments. Moments that included thoughts of suicide, self-medication, and homelessness. Some of these men have found their way back from the brink while others are still standing there, stuck in their pain. The core message of Grieving Dads is “you’re not alone.” It is a message that desperately needs to be delivered to grieving dads who often grieve in silence due to society’s expectations. Purchase - Outside the U.S.
Orders of 10 books or more are eligible for bulk rate discount. All bulk order inquires should email or call for further details. Grieving Dads: To the Brink and Back is FABULOUS. Thank you for have the courage to write it. Grieving Dads: To the Brink and Back is more than I ever thought, simply the best book I ever read on grief for men. Grieving Dads: To the Brink and Back helped me so much, it reminded me of so much, and it gave me comfort. The only kind of comfort that works! Thank you for what you are doing. I am SO sorry that you had to go through what you did to become the life force that rescues me from “The GREAT SADNESS”, but I am so grateful you are there. Thank you so much for writing Grieving Dads: To the Brink and Back and sharing your experience and that of others. I joined the club just over a year ago. You’ve inspired me to reach out to a professional and I now have an appointment for next week. I just finished reading your fabulous book. This should be in the hands of every grieving dad. I have to admit, there were several times that I had to stop myself and feel for the father’s pain. We are not accustomed to hearing the voice of the bereaved father. It was such a learning curve to travel their journey of emotions and heartache. I have read many books on grief and healing and they have all been very touching and helpful. But, Grieving Dads: To the Brink and Back really hit home for me. I would like to say thank-you for your website and book. I live in a small rural town in Victoria Australia and have found it extremely difficult to access resources specifically targeted at dads. I came across your book and then then website a little over 12 months ago and have found it a blessing. I just wanted to say that I started reading Grieving Dads last night, and even though I’m barely into it I must say you hit the nail on the head. Yes, each circumstance of losing a child is unique and you have already given me insight as to how different dads react. Thank you for putting your life and emotions in print. I already have a list of grieving dads with whom I will be sharing. I received your book this morning and read it from cover to cover. I am a health professional trying to support a family who have tragically recently lost a child. I think it is the perfect resource for me to share with my very quiet, buttoned up, supportive of his wife, gentle giant of a Dad whom I have been so concerned for. 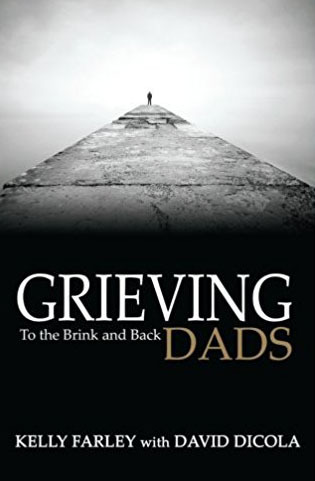 Grieving Dads: To the Brink and Back has helped me to understand that what I’m feeling and going through is “normal” in the sense that most dad’s feel this and it’s scary how some of the items discussed in the book are exactly what I have been through. I want to start by thanking you for this book. Reading Grieving Dads: To the Brink and Back was my first step in starting my healing process, and it provided me with insight and perspective as to how to start this whole thing. I still struggle with it because I’m afraid to deal with my emotions. Your book put me back on a good path of healing when I was in the midst of a horrible path as I was resorting to alcohol and trying to ignore my grief. Grieving Dads: To the Brink and Back is the only one of its kind, and I just wanted to thank you for having the courage to express your feelings and experiences with loss along with all of the other dads in the book. God bless you brother and thank you a million times over. Thank you for the guidance your book gave me into putting my life back on track. I have been reading your book Grieving Dads: To the Brink and Back and it’s helping in a lot of ways. Knowing that the feelings and emotional hell I’m experiencing is shared by others who have had to face and continue to struggle with on a daily basis is at least helpful in a way that I know I’m not alone or going nuts. I want to thank you for the site and book! I’ve definitely read it a few times. I wanted to reach out to you and let you know how you and your book have inspired me. I’m almost halfway through it and I have found myself relating to many of the thoughts shared by these men. I am feeling support in these pages and knowing you’re there. Thank you so much. You probably don’t recall me, but I have credited you many times in my story with holding me back from doing the unthinkable. In a moment of extreme desperation, I called you one night and you were able to say the things I needed to hear. I don’t remember what you said but it was the fact that I was speaking to someone who knows the gut wrenching pain. It was enough. I wanted to touch base with you to encourage you to continue helping grieving Dads. You have no idea the difference it makes. You’ve certainly made an impact on many grieving hearts. Thank you so much for all that you do. All I can say is, thank you my brother! Thank you, Kelly, for writing Grieving Dads: To the Brink and Back. I downloaded this book over the weekend and finished it in two days. It was exactly the book I’ve been waiting for. I learned a lot about survival in the years after the death of my children. My story empowers and inspires. Not only do I understand the impact of losing a child, I’ve lived it and survived it. It is important for me to share my knowledge and experience with grieving parents and caregivers. Please fill out the form below for more information on updates and news.